Actually, bonus round and afterthought. First, the afterthought. In a recent post for The New Yorker taking a second look at data about American reading habits, I wrote that “there’s a little bit of good news: the average American reader spent 1.39 hours reading in 2003, rising to 1.48 hours in 2016.” But I’m not so sure now that that’s good news. I imagined a bulwark of readers who were redoubling their devotion to literature in a time of crisis, but another explanation of the surge occurs to me. Maybe we’ve lost the fair-weather, lightweight readers, and all that’s left is a core who have always spent serious time on reading. Now the bonus round. One of the graphs of reading habits that I made got left on the cutting-room floor, because it seemed to require more explanation than it offered enlightenment. But here on my personal blog, I’m free to bore you a little if I want to. So here we go . . . 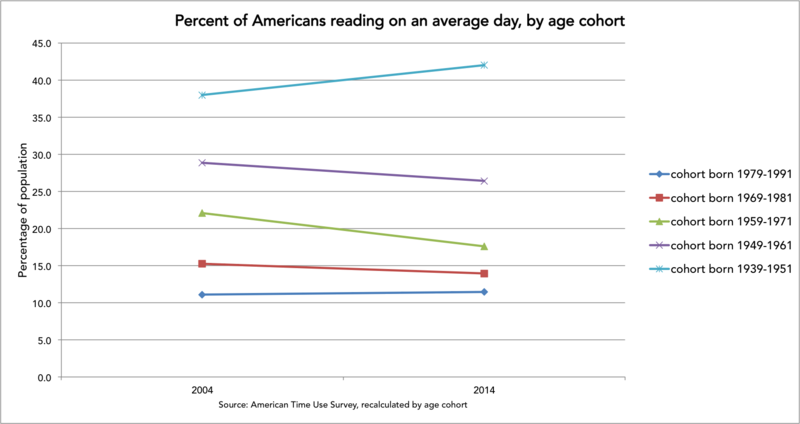 The youngest Americans in this graph, born in the 1980s, managed to increase their reading time a little over the course of the decade, but not by very much; it’s probably another case of what I refer to in my post as a dead-cat bounce. Every other age cohort read less at the end of the decade, except for the oldest, representing people born in the 1940s. That result may be untrustworthy, however, because my averages compare the 55-64-year-olds of 2003 to 2006 with those who were over 65 between 2013 and 2016, so there are late-septuagenarians, octogenarians, and nonagenarians in the mix, avidly reading and skewing the turquoise line higher than it deservedly should go. Keep in mind that this graph is a little kludgier than the ones presented in and linked to in the original post (that’s why it got left on the cutting-room floor; sharp eyes will have noticed, for example, that the age cohorts that I’m comparing here overlap in birth years at the edges), but I think the overall pattern is suggestive enough for a blog on teh internet’s peripheries. Over at the New Yorker’s website, I’ve revisited the numbers on Americans’ reading habits. If the recession lasts another year, the New York Times will probably survive. If it lasts two more years, analysts aren't sure. That's one way of reading the latest reporting about the paper's future from the New York Times itself. By borrowing $250 million in January from a Mexican billionaire at what it calls "punishing terms," the paper, according to analysts, "has positioned itself well to ride out another year of recession, maybe two." The trouble is that the analysts also say that the Times accepted the punishing terms because they expect they will only be able to get even worse loan offers as the recession progresses. "Maybe two" years isn't a comfortingly distant horizon. Another official revelation in the article: Somewhat morbidly, the longterm health of the New York Times is now understood by those who guide it to be conditional on the death of other newspapers across America. "There is a feeling among analysts that there is merit to the last-man-standing strategy," the Times reports. In 2010 or 2011, one analyst suggests, "there could be dramatically fewer newspapers," and absent those competitors, the Times should be able to prosper. To me this sounds a little bit like saying that in the event of a plague, there will be proportionally speaking a lot of canned food left over for survivors.